Sony is one of the leading company in this world. It provide number of electronic products from professional cameras to mobile phones to TV's & Laptops. Out of all these things, mobile phones are most popular. Even I also prefer them. If I'll talk about android, then you can buy number of Sony smartphones starting from 10k to 30k+ range. No doubt, each and every person buying a new Android phone will always look for a healthy battery life. Although battery life depends on number of factors like app battery usage, screen lightning (dark or light colors), brightness level, bluetooth, Wi-Fi, Hotspot, NFC, mobile data usage etc., but these thing are same for every Android user i.e., they depends on how a particular person use its phone. Expect all these things, type of battery and its power (more technical, mAh or milliampere-hour) plays an important role. Earlier I had posted an article on how to improve Android device battery life. I highly recommend you to read that post first. Comparing to other smartphones, Sony Xperia has very good battery backup. It's not like a Samsung which drain very fast. Moreover, you can also buy an extended battery case for your Sony Xperia phone from nearby showroom. It can be helpful when you're in remote areas. Many Samsung users complain about hang program and this is the main reason why people hate Samsung Android smartphones. Actually this is due to cached files. Before explaining this, let me ask you one question. What determines phone performance? Of course, it's the RAM memory. More RAM memory will be, more good will be your phone speed and performance. After a long use, lots of junk files are saved in RAM which ultimately results into slow down in speed. Sony is good in camera quality. I have Xperia C3 Dual and it has 8 MP rear camera and 5 MP front camera with flash light in both of them. This one is considered as one of the best selfie king. You can also record HD videos with it. Speaking frankly, I found two drawbacks in Sony cameras. One of them is file size. When I do video recording, even 5 minute videos goes beyond 500 MB in size. So it become hard to share those videos on social media. How can anyone upload 500 MB, no way. However, if you want to make HD videos then obviously you've to compensate with file size. On the other hand, photos quality is quite better than normal but when you'll zoom it, it will look like a painting, LOL. It would be better if you'll check its camera quality of your own. 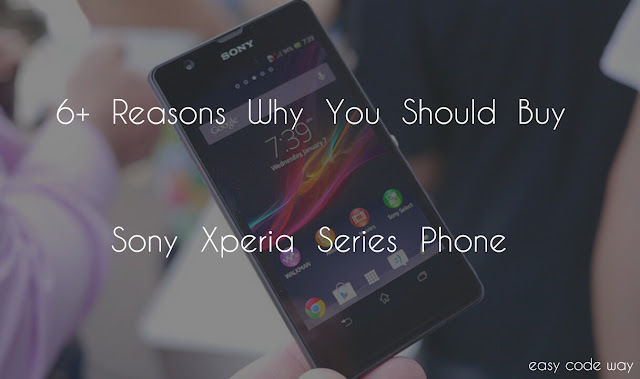 Sony Xperia series has number of models in every budget range starting from 10k to 30k+. You can choose any model as per your own requirements. The only phone series I can imagine after iPhone is Z series. However, it is very costly but as per the features it offer, it is very good for professionals. If you want a perfect phone which would be under you budget range and covering all feature that you want then go with C series. For daily use, you can opt M series which is lowest of all these. Before ordering any phone, please check its specifications and then compare it with other series phone. So basically, what I want to say here is that Sony has a wide range of budget & model and thus you have more options to find perfect mobile for you. Obviously product value decreases after its use and even after a day you bought it but comparing to other big brands like Samsung and HTC, Sony has very good resale value. So this is another positive point for Sony users especially to those who frequently change their mobile time to time. To clearly explain this more, Imagine if you have three mobiles. One of Sony Xperia with more than 25k+ cost and other two as Samsung and iPhone 5s with same budget range. Now If you want to sell all these mobile to me then which will be charged more. No doubt, it is iPhone which has highest resale value and then Sony and at last Samsung. So its good to buy a phone which has more than average resale value. The most amazing thing about Sony Xperia phone is that they are waterproof. Not of all them but almost all phone's with 20k+ cost are waterproof. Many people don't believe this fact and even I was one of them. Believe it or not, few day back, I was in bathroom and by mistake my phone goes inside bucket full of water. I was really scared. After checking it completely I found that everything is fine expect sound quality. After few hours of heat from sunlight, its sound speakers also started working as normal. From that day, my trust for Sony become more strong. One more interesting thing that I want to clear is that waterproofness depends on depth, pressure, water solubility and other factors. Chances become low when your phone is in high depth where pressure and water solubility is more. Z series is water-resistant to many extent. Finally it's your turn to review Sony Xperia. Go and buy your favorite phone now. If you've any questions, feel free to drop your views in below comment box. Stay tuned for more latest updates!